On Friday, April 12, Head of Communications Kristen Tate will moderate a panel discussion titled “Women in Architecture: Turning Designers into Leaders,” which is part of the upcoming American Institute of Architects Europe Spring Conference on Architecture and Urbanism in Copenhagen, Denmark. She will lead a dialog with partners, CEOs and directors from some of Denmark’s other leading architectural firms. The AIA Europe conference will focus on livability, and will explore Copenhagen’s response to key factors that affect many European cities including sustainability, work/life balance, the cycling culture, designing with acoustics, lighting and water, and public and private space. For more information about the event and program, visit www.aiaeurope.org. Three of Schmidt Hammer Lassen’s rising talents – Senior Associates Thomas Bossel and Mads Lassen, and architect Mathias Brockdorff – travelled to Dallas, Texas last week to add to the conversation about how architecture can shape the revitalization of a once-thriving local community. The three architects won an internal competition to design a mixed-use hub for the South Dallas neighborhood to catalyze investment, growth and regeneration. The architectural proposal that prioritized safety and multi-generational learning resonated with the competition judges. It also served as the focus of a panel discussion that included community leaders such as Ron Stelmarski, Design Principal and Design Leadership Council member at Perkins+Will, Dallas City Councilman Tennell Atkins, Architect and Developer Kimberly Dowdell, Real Estate Editor at D CEO Magazine Jeremiah Jensen, and locally-based Reverend Todd Atkins. Thomas, Mads, and Mathias presented their “Fair Community Hub” project designed to make South Dallas more attractive to homeowners and foster economic development. For more information about the project, visit www.perkinswill.com. We’re looking for bright minds open to working on international projects at a 200-person Danish architectural firm. As an architectural intern, you’ll help us develop projects across a variety of typologies and scales – from interior design to masterplans, and from adaptive reuse to cultural to large commercial projects. Together with skilled, experienced architects, you will develop skills and discover new ways of working. This includes conceptual sketching, computation design, scripting, prototyping in our fabrication lab, renders, and graphical post-production. In addition to architectural interns, our Copenhagen Fabrication Lab – a group focused on actively developing computational methods and tools to streamline manufacturing of mock-ups, prototypes, and models – is looking for an enthusiastic intern to join the knowledge-based prototyping practice. We are also looking for a curious and resourceful full-time intern to join our Business Development and Communications team in Copenhagen. The department is responsible for internal and external communications, research, and visual material production, and for developing, acquiring, and assessing potential projects for Schmidt Hammer Lassen globally. As a member of the Business Development and Communications team, you will be working in a dynamic, international environment in close connection with architects. Read more about the internships we offer and apply here. The world’s leading property market is celebrating 30 years, and we’ll be there for four inspiring days with colleagues, clients, and partners. Meet Partners Morten Schmidt, Kristian Ahlmark, Nathan Smith, and Associate Partner Mads Engel who will be at MIPIM in the Palais des Festivals in Cannes, France March 12-15. They look forward to connecting with new and familiar faces, and sharing our most recent adaptive reuse, waterfront, mixed-use, and office projects. Schmidt Hammer Lassen Architects, together with Australia-based Hames Sharley, is leading the redevelopment of TL Robertson Library at Curtin University in Perth, Australia, an iconic brutalist structure that welcomes two million visits annually. The library, built in 1972, was originally designed with little natural daylight in order to protect the thousands of books and other physical materials in its collection. Schmidt Hammer Lassen aims to create a “living library” by opening up new pathways for visual and physical connectivity throughout the building site, while bringing natural light into the space. The new open, light-filled scheme will support knowledge sharing and connection, and ensure the library meets the needs of future users. The TL Robertson Library, Schmidt Hammer Lassen’s second library project in Australia, will celebrate its 50th anniversary in 2022, the year the project is scheduled to complete. The Danish Cultural Institute in Warsaw, together with Rising Culture and Business/Denmark and the Municipality of Aarhus, will host “Future Living”, an exhibition at the newly opened ZODIAK Warsaw Pavilion of Architecture in Poland. The exhibition will address several of the UN’s 17 global goals for sustainable development, with a focus on the major global challenges posed by urbanisation, climate, and welfare. On March 8, 2019 Partner Rasmus Kierkegaard will present two Schmidt Hammer Lassen Architects projects on exhibition — Dokk1 and Gellerup’s Sports and Culture Campus. They are examples of how we can rethink the future and contribute to the sustainable development of our society. For more information about the event and program, visit www.dik.org.pl. 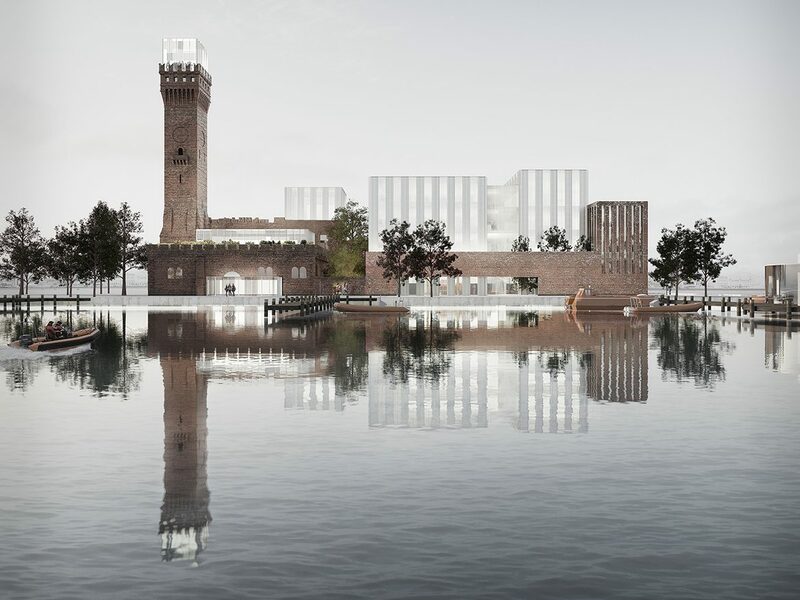 Aarhus City Council has appointed Schmidt Hammer Lassen Architects, together with developer A. Enggaard A/S, AART Architects, Labland Architects, Rum3 Studio and ATP Ejendomme, to design two plots at Sydhavnskvarteret, a new 65,000-square-metre urban development along the southern harbour of Denmark’s second largest city. Sydhavnskvarteret will become a unifying urban development icon and a versatile reflection of city life. The plan will combine the diversity of the existing settlement with a new connection to the city’s waterfront. The project will comprise a hotel, cafes, retail, offices, art installation spaces, workshops, and recreational urban spaces. More information (in Danish) about the project can be found here. Two Schmidt Hammer Lassen projects — Beijing Vanke Times Center in Beijing’s busy Chaoyang District, and NIO House Hangzhou West Lake located on a UNESCO World Heritage site — were shortlisted as finalists among 1,117 submissions from 323 companies. The China Real Estate Design Award is one of the most influential awards for architecture, interior and landscape design works in China, and is judged by leading Chinese developers and architecture professors among other industry leaders. Winners will be announced at an award gala in April 2019. More information about the awards can be found at www.redesign-award.com. Read more about Beijing Vanke Times Center here and NIO House Hangzhou West Lake here. Schmidt Hammer Lassen Architects is leading the design of the Seaport World Trade Center, an expansive 68,500-square-metre mixed-use development on Commonwealth Pier in Boston’s vibrant Seaport District. 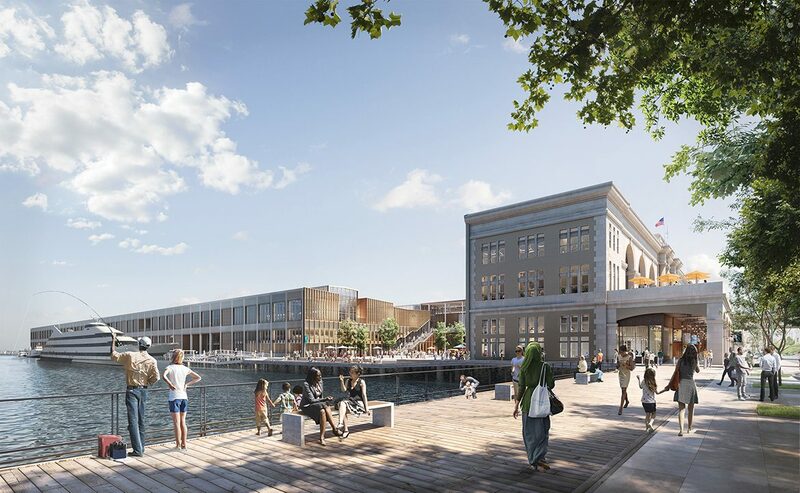 The existing site, once the largest pier building in the world upon its completion in 1901, will transform to include modern, flexible office space; new public amenities, retail, and dining; and dynamic event space. International real estate advisor Pembroke drew upon the design expertise of Schmidt Hammer Lassen along with Boston-based architectural firm CBT for the adaptive reuse project that maintains the site’s historic origins, while introducing new materials, increased daylight, and new points of connectivity. Throughout the development, 15,200 square metres of new and enhanced outdoor public space including courtyards, walkways, green rest spaces, and a grand plaza, will invite office workers and the public onto the pier. The new 2,300-square-metre public waterfront plaza located near the southwest corner of the site will become the pier’s central gathering point. The pedestrian experience along Seaport Boulevard will improve with the addition of 4,180 square metres of new retail space across the upper and ground floors of the iconic Headhouse structure, as well as increased connectivity to the upper level of the Seaport World Trade Center. The Seaport World Trade Center has a sustainability target of LEED Gold certification and is Schmidt Hammer Lassen’s second U.S. project. home along the water and believe in its power to change cities and enhance the human experience.